Can two years in a row be considered a tradition? Last year, I wrote Lessons in HR from Miracle on 34th Street. In keeping with the holiday season, this year, I’m focusing on workplace lessons from that Frank Capra Christmas Classic, It’s a Wonderful Life. For those of you who weren’t around in the 80’s, when the film was shown over and over on countless television stations due it’s being in copyright limbo (read the history here), it’s the story of a man named George Bailey. George is a young man who dreams of travelling the world, but instead is stuck running his family’s Building and Loan in the small upstate New York town of Bedford Falls. When an unfortunate turn of events results in the near ruin of his business one Christmas Eve, he contemplates suicide. Clarence, an angel who has not yet earned his wings, comes to earth and shows George what the world would be like had he never been born. George comes to realize the numerous ways he has positively affected those around him. In the end, the many friends he has made over the years come together to bail him out. The first lesson you can glean from It’s a Wonderful Life is that you don’t always get to follow your dreams. Numerous times, George tried to leave Bedford Falls, but circumstances (the death of his father, the Great Depression) interrupted his plans. Growing up, we are often told that we should follow our dreams. Whether it’s to be an NFL quarterback, an Astronaut or a Nobel Prize winning scientist, we are sold the message that we can be anything if we just put our minds to it. Truth is, we can’t. Maybe we aren’t talented enough. Maybe we weren’t at the right place at the right time. Perhaps, like George Bailey, life interrupts. Me, I once dreamt of writing the Great American Novel, or at least the Great American SF Novel. But unless you get lucky enough to hit the bestseller list, or sell the movie rights, being a novelist isn’t going to pay the bills. So I took the jobs that came along, and one thing led to another. If someone told me 20 years ago that I’d be working HR, I would have asked, “What’s HR?” But here I am, and I’m all the better for it. The second lesson from George is that life is duty. George doesn’t run the Bailey Business & Loan out of a passion for banking. He does so out of a sense of duty, to his family, his community, his customers. There’s a lot of talk these days about having fun at work. As I’ve said before, if work was fun, they wouldn’t pay you for it. George knows this all too well. So do the rest of us. We have people depending on us – our kids, our spouses, our coworkers, those we serve. We’ve made a commitment to our employers to do an honest day’s work for an honest day’s pay. We can’t just walk out on all that. But before you get as downtrodden as George contemplating jumping off the bridge into the frigid river, there is a silver lining to these lessons. For most of the film, George is discontent because he never got to follow his dreams. His life was full of have-tos instead of want-tos. But once he embraced this, he discovered that he has gotten much more out of life than seeing the Taj Mahal or the Great Wall of China could ever give him. He was doing good for his community. He was respected. He was loved. His life of sacrifice wasn’t a tragedy, but a life many of us would envy. It is the fulfillment of these little dreams, not the big ones, that bring true happiness and fulfillment. George’s woes begin because his uncle Billy, who works at the B&L, misplaces $8,000 in cash. $8,000! That’s over $100,000 in today’s money. Not only does he lose it, he loses it by accidentally handing it to Mr. Potter, the unscrupulous bank owner bent on ruining George. Uncle Billy is a drunk. He lives with a menagerie of animals, and he’s none to bright. There’s a reason he wasn’t put in charge of the B&L after George’s father died. The board knew he was incompetent. Yet George keeps him on out of loyalty, because he’s family. I’ve seen it a thousand times. I even had one guy who told me, “My father’s was part owner in the company, I can do whatever I want. No one will fire me.” The B&L wasn’t led to extinction because of George’s poor management, but because he was too nice to put his uncle out to pasture with a nice pension. This one mistake was almost the death of George. So if you want to be happy at work, take joy in the simple pleasures of a job well done. And whatever you do, don’t answer calls from that second cousin who’s hungry for an interview. Is that a bell I hear ringing? This entry was posted in It's a Mad, Mad, Mad, Mad Worplace, What's New and tagged Christmas, It's a Wonderful Life, Workplace Lessons. Santa Claus must have a really great PR Firm. Think about it, he went from the Bishop of the small city of Myra in the Fourth Century to become one of the most recognized figures in the world. His image has been on products ranging from Coke cans to Camel Cigarettes. Children wait hours in line to see him. He’s been the subject of countless television shows and films (including one of my favorites – Miracle on 34th Street). To most, he is seen generous and kind. But don’t let all that fool you – as an employer he leaves a lot to be desired. I’ve experienced my share of bad bosses. From the manager who wrote someone up for the improper use of a box cutter after he badly cut his finger to the one who used to tell us to use staples instead of paperclips because staples were cheaper. Yet none of them come close to Jolly Old Saint Nick himself. First off, he’s the offshored his manufacturing operations, taking good jobs away from people who need them. And he didn’t just move his manufacturing to some developing nation, he moved it all the way to the North Pole. Santa Claus is Coming to Town, that stop-motion classic, would have you believe he did this to escape the evil clutches of the Burgermeister Meisterburger. Untrue. The real reason for the move was so that he could work free of regulations that protect workers. OSHA the IRS and the Department of Labor have no jurisdiction at the North Pole. There’s no minimum wage, no overtime laws. He’s free from paying payroll taxes. Ah the workers. We all know that he employees only elves to work in his workshop. Only elves! Where’s the diversity? You might say that elves are a minority, but not in a place where everyone is an elf. A six-foot tall man can’t even get an interview, no matter his qualifications. Santa is practicing a form of height discrimination. I’m guessing that Santa hires elves because of their diminutive size. They are cheaper to house and feed, and it makes it easier from him to loom over and intimidate them. No Napoleon complex there. As for working conditions, we have no way of knowing how clean his workshop is, how safe, whether or not it is adapted for workers with disabilities. No inspector has ever set foot inside it. What we do know is that he has created a company town far away from any regulators. A place were the elves must both work and live if they want to keep their jobs. We can see from other examples how that works. Whether it was the Pullman Town of the Industrial Revolution or modern-day the Foxconn facility in China, they are often rife with employee abuse, low pay and poor working conditions. Santa would have you believe that all the elves spend the year happily making toys and whistling while they work (sorry, those are dwarves). But do we know this for sure? We don’t even know if they get paid, or if they do, how much. And if they do want to do something different (be a dentist perhaps?) it’s not like they can leave. There are hundreds of miles of frozen tundra between them and civilization (and no, Buddy, you’d freeze to death trying to walk it). He has a captive workforce that he can treat as badly as he wants and still maintain zero turnover. Then there’s all that watching and judging. The NSA’s surveillance program pales in comparison. Sure, he says he’s only watching the kids, but don’t you think someone like that would also be watching his employees? Spying and sitting in moral judgement of who’s naughty and who’s nice (who is he to decide?) is no way to build the trust of your workforce. So let’s face it, Santa makes Scrooge (pre-ghost years) look like a candidate for the Best Boss of the Year award. I’m sure he doesn’t care. He’ll fill our stockings and place presents under our trees just like he always has, and keep abusing his employees regardless. 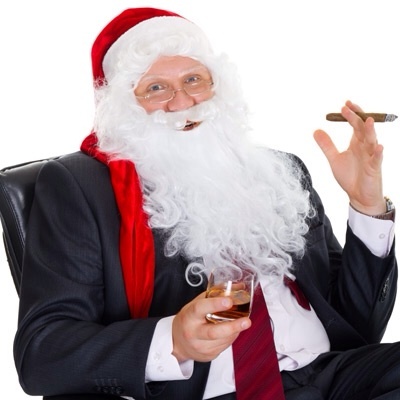 This entry was posted in It's a Mad, Mad, Mad, Mad Worplace, What's New and tagged Bad Boss, Santa, Santa Bad Boss, Santa Boss, Santa Claus.